How do I clone Scopes in my KnowBe4 KCM GRC account? The KnowBe4 KCM Governance, Risk and Compliance (GRC) Platform offers the ability to clone any of your compliance-related or general project Scopes. Cloning Scopes may be helpful in a number of scenarios. For instance, perhaps you manage regulatory compliance for your organization's various locations or subsidiary organizations. If these locations or subsidiaries have different systems, networks, and/or processes in place, while having the same regulations or frameworks to comply with, you can easily clone the necessary Scopes–giving you the ability to replicate Scope Requirements and the associated Controls in a matter of seconds. See the sections below for instructions on cloning Scopes and your options in this process. After logging in to your KCM GRC account, navigate to the Compliance > Scopes > View Scopes section, from the navigation panel on the left-hand side of the screen. Click on the title of the Scope you'd like to clone. Under the Overview tab, click the Clone Scope button on the right-hand side of the screen, as shown below. A prompt will appear with two options for how you'd like the system to handle the Controls that are mapped to your original Scope. Please see the sections below for more information on each of these options. Control Tasks are not transferred when Scopes are cloned. 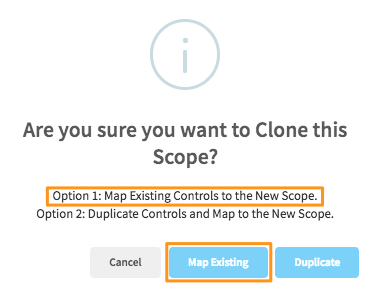 The first option you have when cloning Scopes is to Map Existing Controls to the New Scope. If you choose this option, the Controls that you've already mapped to your original Scope will be reused. These Controls will maintain their existing "mappings" and an additional "map" will be created to the cloned Scope's Requirements. Please see our Mapping Controls and Requirements article for more information on Control and Requirement "mappings". Once the Scope is cloned, the new Scope will be viewable from the View Scopes page. The word "Copy" will be added to the title of the cloned Scope. 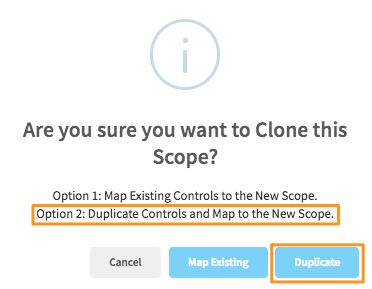 If you need to clone multiple versions of the same Scope, as a best practice we recommend renaming the cloned Scope before creating an additional clone. 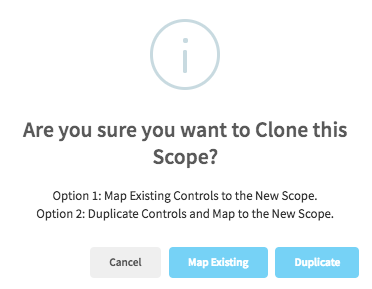 The second option you have when cloning Scopes is to Duplicate Controls and Map to the New Scope. If you choose this option, a copy of the existing Scope's Controls will be created with the same Control Name and Description. These duplicated Controls will be mapped to the appropriate Requirements in the cloned Scope.